The Ipswich town Christmas tree is said to be from out of space! We recently wrote a blog post on how times have changed, in the ways that we have now moved on from real Christmas trees to outdoor artificial trees. In a whole new league of it's own, the Ipswich town Christmas tree looks like something from out of space! It has caused a lot of disappointment throughout the town, but then again also a lot of happiness. Shoppers have been left outraged after town hall bosses ditched their traditional Christmas tree in favour of a 'futuristic' £10,000 monstrosity. The towering 21st century ‘tree’ has left people in Ipswich town centre bemused after it appeared this weekend – with one comparing it to 'a load of space-age hamster balls'. The 30ft Christmas decoration includes 41 aluminium spheres covered in more than 40,000 low energy LED lights. The tree is part of a brand new £100,000 Christmas display across the town funded by taxpayers and businesses in Ipswich, Suffolk. The costly display – which includes 250,000 low energy bulbs – was thought up by business bosses in a bid to help attract more shoppers to the town during the festive season. But shoppers have been less than impressed by the tree. Mother-of-two Maggie Bailey, 38, from Ipswich, said: 'It looks like a load of space-age hamster balls rather than a Christmas tree. 'I dread to think how much it has cost but surely Christmas is a time of tradition, so why do they have to have an arty tree? Martin Hall, 64, from Bury St Edmunds, added: 'It is certainly unusual – I guess people will be talking about it so in that respect it could be judged to be a success. 'I certainly wouldn’t want one like this in my living room but maybe I am behind the times. Traditionally Ipswich has celebrated Christmas by erecting a large fir tree in the Cornhill – a market square which has been in use for more than 500 years. But business leaders – including members of business group Ipswich Central which helped pay for the tree – say the town needed to break from tradition. Paul Clement, chief executive of Ipswich Central, defended his towns controversial futuristic structure saying its now infamous design will help get people talking about the town. He said: 'This is the most talked about tree in East Anglia – probably in the UK this year. “Love it or hate it, everyone is talking about it, and thousands of people are heading into Ipswich to see it and make up their own minds. But that response didn’t impress traditional shopper Dennis Nedd. He concluded: 'I would have just liked a normal Christmas tree. In Herne Bay, Kent, last week pantomime stars Gareth Gates and Toyah Wilcox were jeered by crowds who were shocked by the 'atrocious' decorations as they tried to turn on the lights. The pathetic tree did not look like it was in the Christmas spirit with merely a handful of lights – leading residents and business leaders to slam it as having the 'worst decorations in Britain'." Well, there certainly are some extravagant Christmas tree designs out there, but if traditional is more your thing, then we are the people for you. Our Christmas tree farm is filled with Fraser Firs, Nordman Firs, Pot Grown Christmas trees and much more! Not to forget next weekend Santa himself will be stopping off, so be sure to visit the farm yourself to get your requests in to him just in time for the big day! This year’s Trafalgar Square Christmas tree has begun it’s 700 mile journey! Did you know the famous Trafalgar Square Christmas tree is sent as a gift from Oslo to London each year? This year's 21 metre tall and 115-120 year old tree has today begun it's 5 day journey from Norway to the UK. began its five day journey from Norway to London. The Norwegian spruce, which is an annual gift from Oslo to London, will travel more than 700 miles by boat from Norway to the UK after it was specially selected for its height and beauty by experts. The Evening Standard was invited to see the tree being felled by the Mayor of Oslo and the Lord Mayor of Westminster at a special ceremony in a forest just outside the Norwegian capital on Friday. The tree, which is between 115 and 120 years old and measures 21 metres tall, is the sixty-sixth to be sent to the capital as part of a tradition which started in 1946 to thank Britain for its support during the Second World War. After a performance of carols sung by local school children, Oslo mayor Fabian Stang and Councillor Angela Harvey cut the tree with the help of pupils from St Paul’s primary school in Whitechapel, Faridah Babirye, 10, Aysha Ali, 9, and Yasin Kuddus, 10. It was finished off by a lumberjack with a chainsaw before it was lifted by crane into a truck and driven to Brevik to be shipped to Immingham, Lincolnshire. It will then be driven to London for a tree lighting ceremony in Trafalgar Square on December 6. There will also be a three-day outdoor exhibition in Trafalgar Square of Norwegian artist Edvard Munch – including a print of the famous Scream painting – to mark the 150-year anniversary of his birth next year. The tree, which was selected for London about a month ago, has been fed fertiliser to ensure it gets a strong green colour and neighbouring trees are cut down to make sure it gets enough light. Councillor Harvey told the Standard: “This is a tree that’s given in friendship from the people of Oslo to the people of London although it’s a tree that’s come out of times of difficulty it’s a symbol of the friendship between us now. She said she would be getting daily updates about the tree’s journey. Mr Stang added: “The gift of the tree started as an expression of our gratefulness of support we had after the second world war but now it is a nice way to express our friendship now and how important it is to support each other when someone is in a difficult situation.” "
We are getting busier and busier each day as Christmas approaches, and we can't emphasise how important it is to get your orders in as soon as possible. Why not pop down to the farm and pick out your real tree personally? You might even run into Comet or Cupid! Artificial Christmas trees… in the garden?! Most people in the UK now make use of artificial Christmas trees in their home, as opposed to having a real Christmas tree, but putting these artificial trees outside in the garden?! That is something certainly unusual, yet there has been a significant rise in the number of people doing this in the past year. FAMILIES struggling for space among their supersize sofas and widescreen TVs are now putting their Christmas trees outside in the garden. But they are not planting them, these are artificial ‘outdoor fashion trees’, one of the biggest new festive trends for Christmas 2012. The shift is part of a wider shift away from real trees towards artificial alternatives. 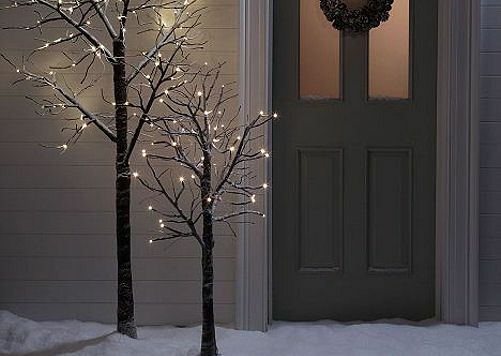 Figures from top department store John Lewis have revealed that demand for faux trees that will live outdoors has already shot up 70per cent on last year. And a recent study published by Which? showed that fewer than one in five households plan to have a real Christmas tree, such as a Nordman Fir this year. By contrast 49per cent said they would be putting up an artificial tree, which can be used time and again. Smaller living spaces are believed to have played a role in encouraging more people to move their artificial festive fir out into the cold. The most popular outdoor fashion tree is the 5ft Pre-lit Blossom which is built to withstand the elements of the British winter and be placed in a garden or porch. While the chain’s best-selling model overall is the 6ft 8in Snowy Paper Tree, which also took top spot in 2011 and has now been adapted to be used both indoors and outdoors. Other popular unorthodox models include a Glitter Bonsai Tree and a 4ft Battery Operated Porch Tree. Lisa Rutherford, Christmas Buyer at John Lewis, said: ‘As in previous years, customers are retaining their taste for trees which offer something different from the norm. Times are certainly changing, but if sticking to tradition is more your thing, why not visit our Christmas tree farm and pick out your real Christmas tree alongside seeing our resident donkeys and reindeer! The Christmas Tree Farm supply trees such as Supreme Nordman Fir, Supreme Norway Spruce, Fraser Fir and living pot grown trees. Whatever you choose, we’re sure your Christmas will be a perfect one with a tree from The Christmas Tree Farm. As we get older, Christmas seems to die down, we no longer rush downstairs at 6am to open all our presents and we don’t get that excited feeling inside as much as we used to. However, with a little commitment you can bring back that magical feeling. As children we generally ask for what we want, rather than what we ‘need’. However, as we get older presents become a lot more practical and our wish lists are full of useful – but entirely unexciting – items such as socks, kitchen gadgets and stationery. This year, try to put the excitement back into Christmas by asking – and giving – some fun and frivolous gifts that you can really look forward to. This doesn’t mean necessarily requesting novelty items you will never use, but maybe try swapping that fancy new frying pan for a pair of high heels or your favourite DVD boxset. Alternatively, ditch the list and hint-dropping and see what fun surprises you end up with! If you want to fully experience the Christmas magic, it’s important to immerse yourself in the festivities and get involved with as much as you can. 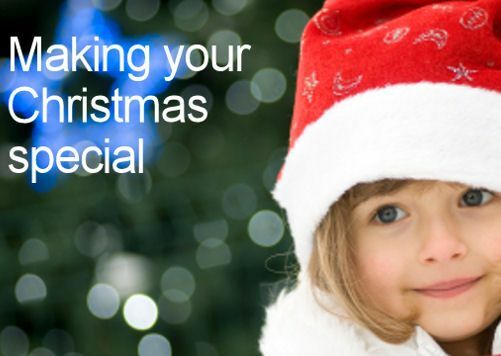 Try to take in a pantomime, attend a carol service and visit as many Christmas markets as you can, for example. To truly immerse yourself in the Christmas magic, filling your playlist with Christmas songs and watching as many festive movies as you can is also a must – and if you want to do it all while dressed in a Christmas sweater and reindeer socks… well, all the better! One of the main points in this article was “Don’t give up on tradition” and a major way to go about doing this, in our opinion, is sticking with a real Christmas tree. Many people have turned to artificial trees for their homes, but how can you beat the unique aroma of a real tree alongside their strong yet soft to touch needles? If a real Christmas tree is what you’re looking for to flare up that magical feeling, give us a call today, as Christmas is fast approaching. A shocking one in five homes in the UK this year are set to have a real Christmas tree up. There are many debates that take place every year that involve a discussion as to whether real or artificial trees are the way to go. The arguments go round and round in circles and at the end of the day, it all dies down to personal preferences. You either love real trees or you believe artificial trees are the way forward. Fewer than one in five homes will have a real Christmas tree this year as traditions dating back to Queen Victoria melt away, it is claimed. Just 13per cent will make the annual trek to the garden centre to pick out a real tree that has been grown and harvested for the festive season. A further five per cent plan to bring in a tree -complete with roots that can be replanted in the New Year. If the figures are to be believed, these doughty traditionalists – totalling just 18per cent of households – are heavily outweighed by those opting for artificial trees. The figures come from research by consumer group Which?, which found that around 49per cent of households expect to put up an artificial tree that looks like the real thing. Another 19per cent will go a step further and have a fake tree that is an artificial colour, perhaps white or a deep red. Cost may be a factor in people turning away from real trees, with the popular Nordman Fir coming in at £35-£55 for a six foot tree depending on the location. At the same time, department stores like John Lewis have achieved strong sales for designer paper trees, which provide a tasteful centrepiece for a room without looking much like a Christmas tree at all. Some may feel that buying a tree to be used and thrown away after just a few weeks is not ‘green’. We believe that real trees at Christmas cannot be beaten by all these diverse artificial trees, which is why we continue to provide you with quality trees year after year. Order your tree this year using our online shop, or why not pop down to the farm and pick out your special tree personally. Whatever you choose, your Christmas will be a very special one with a tree from our farm as we do our very best to provide the best trees in town. Whether you’re the type of person who is always preparing ahead or perhaps you’re always leaving things until last minute, after reading the latest news on the Christmas trees in the UK this year you will certainly be preparing in advance. 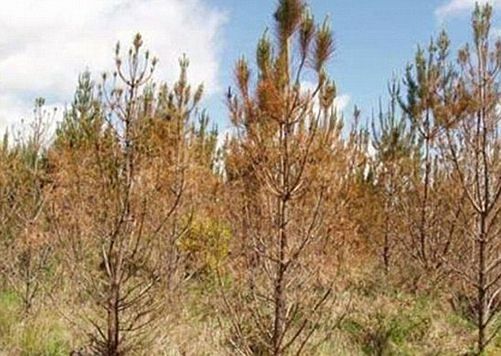 Britain’s Christmas trees are under attack from an aggressively spreading disease that is sweeping through farms and hitting up to 50 per cent of their crops. The condition, called ‘current season needle necrosis’, is killing the Nordmann fir and making hundreds of thousands of the UK’s most popular Christmas tree completely unsaleable. This disease attacks in the build-up to the festive period, turning its needles yellow and then later brown before they just drop off completely. On many farms up to £50,000 worth of Nordmann firs from each field are being cut down and slung on the scrap heap. This species is found in 80 per cent of UK homes on December 25. Although shoppers will not be deprived of their real tree at home this Christmas, first made popular by Queen Victoria and Prince Albert in the 19th century, behind the scenes growers are losing huge sums and fear for the future. It comes as many as 80million British ash trees are under attack from a different fungal disease that causes black spots, cankers on bark and twigs and branches dying. ‘This is a big problem in Europe and the UK,’ Berkshire Christmas tree grower Sadie Lynes told BBC Radio 4. ‘Nobody understands totally why this is happening but it is something to do with a fungus. Experts are still baffled by why current season needle necrosis is becoming so virulent, with Britain’s record warm and wet summers and also the use of herbicides which may be stripping off protective wax on fir needles being blamed. A fungus Sydowia polyspora could be at its heart, but it is not known what causes it and how it can be prevented. As recently as 2010 it was rare but now it is damaging hundreds of thousands of trees across Britain, with farms in the south of England worst hit. Every year we take orders from as early as May! So, to make sure you get exactly what you want this year, give us a call or visit our website to order your real trees as soon as possible. Also, be sure to take a look at the visit us section of the website, after all you don’t want to miss Santa’s visit! If you are dreading getting out the decorations for your tree this Christmas, spare a thought for the professionals tasked with assembling Britain's tallest fake tree. With just seven days to put up and decorate the 27.5m (90ft) framework, the 12-man team must have been glad all the fairy lights on the tree were in working order. They came in a 9km (5.5-mile) chain. Needless to say, the tree at Cheshire Oaks shopping centre, near Ellesmere Port, can be seen for miles. 'The decorations alone weigh six tons. It's so large we had to get planning permission for it,' said John Vasey, 50, project manager for Guildford-based Springfield Decorations in Surrey. The tree features 1,000 football-sized red baubles, 20,000 smaller ones and more than 2km of cabling to light it all up." 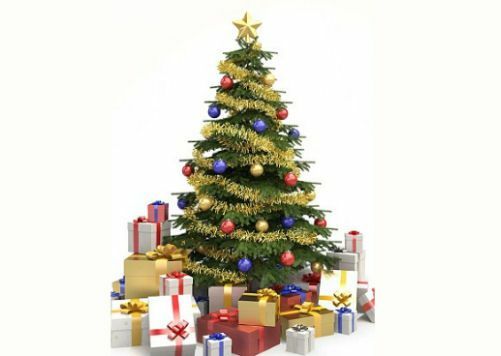 We are getting orders in by the hundreds now, so if you don't want to be disappointed, be sure to contact us regarding your real Christmas tree ideas and we will do our very best to cater for your needs. Sheffield will be illuminated more than ever this Christmas! 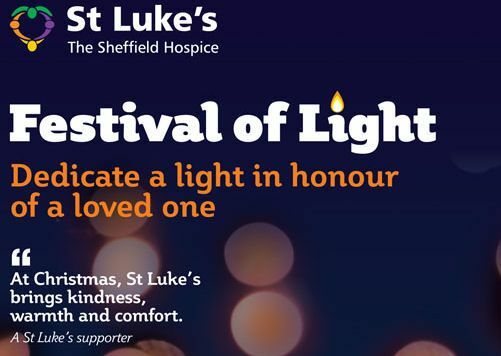 IT may be the scene of major construction work, but St Luke’s Hospice’s annual Festival of Light is still set to go ahead – and this time it’ll be illuminating more of Sheffield than ever. Special plans for the festival, which sees the hospice displaying thousands of lights dedicated to loved ones, are being put in place while a £5 million project is under way to build a new inpatient unit, supported by The Star. For the first time, the celebration will be held at the front of the hospice on Little Common Lane, Whirlow, at 6pm on December 2, with lights covering the front of the building and the tree by the entrance. Entertainment will include music from Holymoorside Brass Band and carol singing by the St Luke’s staff choir. The next day, a Festival of Light tree is being switched on in the main concourse of Sheffield rail station and residents are being asked to put up lights at home and work. An illuminated Christmas tree will be unveiled at Ponds Forge on November 30, and Sheffield Philharmonic Orchestra is playing in support of the hospice on December 8. Other charity events taking place include a Late Night Light Skate at iceSheffield on December 1 and the annual Santa’s Breakfast at Hillsborough Leisure Centre on Christmas Eve. Audrey Rose, chair of the St Luke’s Action Group, said more than £25,000 has been raised for the festival appeal so far. “We have been amazed by the generosity of our supporters, with the average donation increasing by 15 per cent on last year,” she said. In recent years more than £40,000 has been collected towards the £4 million needed every year to keep the hospice open. THE Star has pledged to raise £100,000 to build one of the 14 new single rooms at St Luke’s Hospice in Whirlow, Sheffield – and we need your help. We need readers to help by organising events – whether it is a sponsored sky dive, a walk, a dinner or cake sale. If you have ideas for fundraising events, get in touch. After reading all about the good gestures St Luke’s Hospital carry out during this event, you are probabaly really getting in the Christmas spirit. While you are planning your Christmas shopping, arranging family time and events for the kids, why not visit the farm here in Billingley. You can meet Santa himself or even meet the resident reindeers Comet, Cupid and Holly! It really is a fun day for all the family. Be sure to buy from a trustworthy Christmas tree farm! Trading standards officers at Highland Council are warning the public of an online Christmas tree sales scam. They said a website, www.scottishwholesalexmastrees.com, was offering trees grown at the Inverness Tree Farm, near Aviemore. The officers believe the website was set up in Utah, in the US, and displays a fictional farm and a VAT number stolen from a genuine Scottish firm. A business in England had been about to place a £7,000 order with the website. However, the order was not put through after the business’s boss had concerns about the site. Trading standards manager Gordon Robb said the website displayed an Inverness telephone number. But he added: “With modern telephony services this number could be ported anywhere in the world. “Potential buyers are being told that some of the trees are grown at a genuine Christmas tree farm north of Inverness. 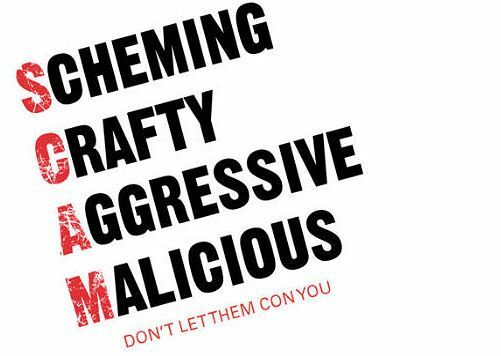 Going to extents such as stealing a VAT number shows just how clever and professional these scammers can be, so be sure to stick to the advice “if in doubt, don’t buy!”. If you’re looking for a trustworthy Christmas tree shop and supplier, then here at The Christmas Tree Farm we can help you have a perfect Christmas time.